The great thing about an Adventure without Subtitles when Allu Arjun stars is knowing that no matter what, the dancing will be awesome. But there is so much more to enjoy in Badrinath, and we had a great time. The plot, for what it’s worth, can be summed up as follows. Prakash Raj is a guru who trains young boys to defend temples in the major holy cities of India. His school is located high in the mountains, and the scenery and the sets are nothing short of spectacular. 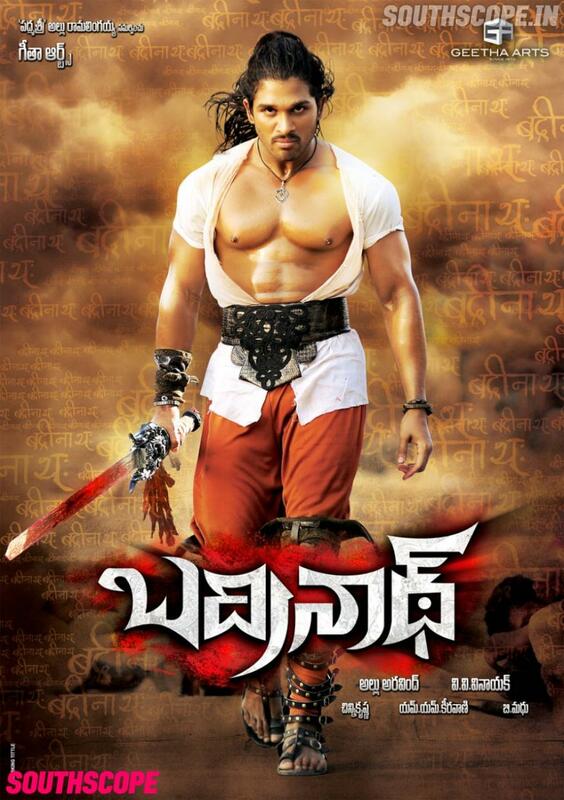 Allu Arjun is Badri, who is assigned to protect Badrinath. Badri has a special relationship with the place, amazing sword and fighting skills, a strong faith in god and his guru, and is earmarked to take over the training camp. Tamanna is Alaknanda, a very pretty atheist who lost her faith after seeing her parents accidentally catch fire and die at a pooja. Badri and Alaknanda eventually fall in love, then the bad guys turn up to kidnap her. Will Badri desert his post, anger his guru and rescue his love? So much drama! This is a vehicle for Bunny and, as expected, he excels in the dancing and fighting scenes. We had questioned the efficacy of an Indian Samurai when pitted against men with guns, but that question was put to rest. You need arms attached to your body to pull a trigger. Swords win! The fight scenes were cool, and it looked like someone may have been inspired by games where each set of bad guys has a particular set of weapons. So once the guys with sickles are defeated, the next batch has axes and so on. It isn’t all gore and anger though; there is room for what our friend calls Funny Bunny and he is joyful in the dances. He does an excellent wet shirt, and even wears a Chiranjeevi inspired silver cape in one song! This pleased us greatly. Tamanna is a beautiful girl, and she can act and dance. She more or less keeps up with Bunny, and her facial expressions when she dances are great. Alaknanda is rarely more than a sketch, a pretty face on the sidelines, and sadly it seems that she discovers faith and love only after Badri slaps her. She also discovers more appropriate clothing. (And she had been spectacularly rude and stupid in the lead up to the slap). There is a fun moment when she keeps pretending to slip so she can fling herself on Badri’s manly chest and cop a feel. That seemed perfectly sensible so we decided we liked her a lot. Her subplot involving abduction by evil relatives and an attempt at forcing her to marry could have been cut back without diminishing the idea of the damsel in distress. Tamanna was very good in 100% Love, and lovely in Badrinath, so we hope more substantial roles come her way. Alaknanda had the best imagination. Most of the songs were her dreams and she spared no effort in dressing Bunny up and giving every single backing dancer the most amazing outfits as well. On the subject of wardrobe, this is what Badri wore as his going into town outfit so there are arguments for and against him choosing his own clothes. Prakash Raj is excellent as the guru. He gets to do pretend martial artsy stuff, levitate, growl at people and also use his misty eyes of love. His character is the cause of Badri’s conflict as he demands the young man be sworn in as his replacement, and thus swear off marriage and women. He probably should have thought that through a bit more. But we could rely on him to do the right thing when it counted and all was well between the master and disciple. The Comedy Sideplot was over represented by MS Narayana, Venu Madhav , Master Bharath and Brahmi among others. Too many! And took up at least 30 minutes that could have been condensed or cut. Brahmi was fun, and the crowd went wild for him, but it was basically the same fleecing the pilgrims shtick he did in Indra. We guess that was a deliberate reference. The supporting cast was full of familiar faces, all of whom do the thing they do so well. We think the Allu family pug made an appearance too so if Ice’s agent is reading this, please confirm? But in an unsubtitled film we tend not to give the support artists their full dues as we have to concentrate on the main action. And yes, there were compelling visuals adding to the distractions. We totally appreciated the backing dancers for their enthusiasm, their dancing and the way they rocked the purple and gold glittery outfits. We did have to notice the evil family as they showed dedication to the bulk purchase of coloured contact lenses, and the matriarch wore some excellent saris. The evil henchmen deserve a shout out. From the Pick n Mix Assorted Terrorist Stereotype Brigade to the Ninjas in Hoodies, they gave it their best, and Peter Hein and team really made them work for their money. He knows how to make chaos look elegant. There are massive plot holes, but they aren’t an impediment to enjoying the story. There is no pretence at realism so questions of why there are never any police around or how Badri could survive the latest incident just didn’t matter. We were far more interested in why people wore some of the crazy outfits. The soundtrack is effective and enjoyable, and the songs are well placed. How well they stand up without the supporting visuals is another question. This is an out and out entertainer that succeeds, and the audience last night certainly enjoyed it. The balance of action and ridiculous stunts with beautiful visuals and fantastic dancing is just about right. See it on a big screen if you can! This entry was posted in Tollywood and tagged Adventures without subtitles, Allu Arjun, Badrinath, Brahmi!, Bunny, Kelly Dorjee, M.S. Narayana, Master Bharath, MM Keeravani, Peter Hein, Prakash Raj, Tamanna, V.V. Vinayak, Venu Madhav. Bookmark the permalink. It’s really quite different to Magadheera and I don’t really think there was any intention to replicate it any more than in any other action film. I’m definitely a fan of the heroine’s imagination 🙂 – she had the right idea as far as modernising Bunny went and she was very detailed in her dream sequences. Just a fun masala film! Allu ARjun is awesome to say the least and I did enjoy him on screen. Kinda wished they had more “Funny Bunny” but never the less, he rocked in the songs something wicked! But yes, wet shirt Bunny definitely gets a tick!! I agree on the Tamannaah front though(her spelling has changed all the pronunciation hasnt) but on with a twinge of sadness. If you get a chance, take a look at her Kalloori. She was effortless natural in that and when you see her barely there barring some half-baked scenes, its disappointing but she has merit and will definitely go far. I didn’t actually feel a Magadheera vibe at all but I was seeing a bit of Indra initially. Adding the constant references to Kasi (Indra’s initial backdrop) and Indra by Brahmam darling and co. But its funny, how your audience enjoyed themselves while mine were laughing at the jokes and dancing to the tunes but muttering their annoyance as they walk out. But I love how you described your enjoyment. I might catch another viewing just to see it from your eyes but I’m worried mine might come in the way. Lol!! Yes the wet shirt is bound to join fans together. But did u get a Will Smith from his Fresh Prince day in the ‘iktara’and ‘Ambadhari’ songs? Especially with the glasses! As catchy as it was, I still can’t get enough of Nath Nath!!! Sunidhi and Jassie are amazing for Tamz and Bunny!! Temple and I did discuss on the way out that it felt much more like an older Chiru masala film rather than a more modern day action flick. No complaints about that at all. The audience, although smaller, was still appreciative. Maybe we just have a big Allu Arjun fan club here in Melbourne? I think I should start watching telugu movies..sounds good! On an aside – Am a bit confused – who is Bunny? Is it a nickname for Allu Arjun? BTW When I type in a comment, I cant see anything at all, because it types black on black!!! I think it’s a browser thing. I’m getting dark grey on black and I’m using an older version of Windows. I agree it’s hard to see! Absolutley you should watch some Telugu films – they are much higher on the masala ingredients and have some excellent dancing! I thought it was better second time round as well, so I’m looking forward to getting the DVD (with subtitles) and hopefully seeing all the limb amputations in all their glory! And definitely happy to read it’s a Chiru inspired movie (Arjun was saying he did his best to emulate Mega Uncle in one of the songs) because I will never object to such delightful sources of inspiration.